I’ve been feeling a lot lately. Nostalgia, pain, joy, sadness, exhaustion, exasperation, peace, ambition, complacency, anxiety — it’s been quite the week, the month, the summer. You can imagine that, with all those things floating around in my head in addition to normal day-to-day life, I’ve been doing a lot of staring into space. In short, my brain needs a break. While I’m sure any sane person would take the opportunity for down time to read, or sleep, or go for a bike ride, or sit in front of the television all day watching a “Mad Men” marathon (which I, too, am wont to do) — when I need to decompress, I go to the kitchen. And when I need to feel comfort, I make pancakes. 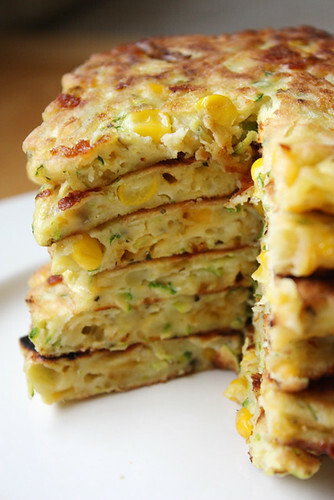 These zucchini corn pancakes found themselves being made in my kitchen this last weekend, after a particularly long bout of drooling/daydreaming/wide-eyed space-staring (JOKES. About the drooling, that is. The uncomfortably long period of space-staring, not so much). I wanted to make something slightly different than the old standby, but nothing too difficult. This recipe fit the bill. And it was perfect, with crunchy sweet corn, soft, fresh zucchini and tangy sharp cheddar cheese. I topped mine with salsa and sour cream and I was done for — for the first time in a great while, I could think of nothing else but finishing my plate. And that, my friends, is why you make pancakes when you’re feeling overwhelmed. Because for one, albeit brief, moment, all you need to — all you can — think about are pancakes. Yummy, fluffy, delicious, simple pancakes. And perhaps that will bring you more joy than anything else you’re feeling in these busy days. In a large bowl, combine eggs, oil, salt, pepper and dried herbs. Whisk to combine. Add the zucchini, corn and cheddar cheese and stir thoroughly with a spatula. Add the flour and stir until thoroughly combined and there are no pockets of dry flour hiding in the batter. Heat a large cast-iron skillet or griddle to medium-high heat, adding a very small amount of oil to the skillet/griddle. Using an ice cream scoop, scoop 1/4-cupfuls of batter onto the skillet and flatten, if necessary, with the back of the scoop into a circle about 4 inches in diameter. Cook on each side about 3-4 minutes, or until a deep golden brown. Remove from skillet and transfer to a plate. Repeat with remaining batter. Serve warm with your favorite toppings (I’m partial to salsa and sour cream). I also go straight to the kitchen when I’m feeling overwhelmed (either to grab chocolate from the fridge or to actually cook!). These pancakes sound like a perfect fix for those stressful moments, and I love how you used so many vegetables! Ooh — great idea and good flavors. 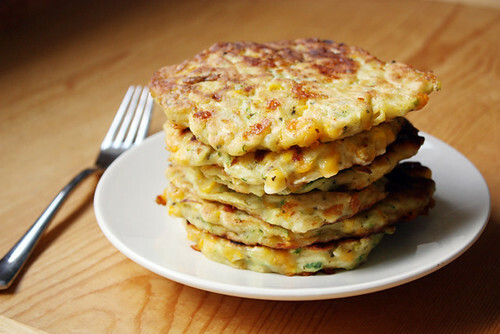 I posted zucchini corn pancakes recently, but used dill, walnuts and feta. It’s zucchini season! 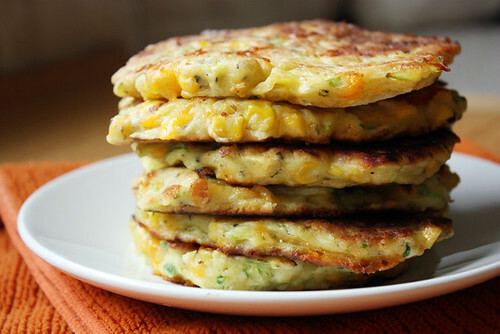 I am dying to give these a try- looks like a terrific way to use up a glut of garden zucchini! I just made these….Absolutely delicious!!!! Love this recipe. So much. I’ve shared it on the Cabot Facebook page! Wendy — Great, thanks for sharing! Really nice writing! I can so relate! Holy super duper happy tastebuds, batman. These are amazing! Like competely and totally amazing. I’m not sure even a cranky toddler pulling on my pant leg could ruin the bliss I feel when eating one…straight off the griddle, still piping hot. I may or may not have eaten several that way. Totally easy to make allergy friendly as well. And now I have a delimma. Serve them for dinner tomorrow night like originally planned or hoard them all for myself and make the fam eat sandwhiches. This is a tough one! Thanks for posting this great recipe! I just put these into my calorie counter to see how often I could eat them. Because I’d like to eat them all day every day! So, I thought I’d share the results, which aren’t too bad considering the flour and cheese: 220 cals per pancake (20/11/10 g carbs/fat/protein; plus about 10% each of your daily vitamin A, C, calcium, & iron). Amir — Glad you liked them! Tried these tonight and they were awesome. I ate them with sour cream and a couple with the juice from the pork tenderloin I had made in the crock pot. Thanks again for posting this! Definitely will be a go to recipe for me this summer! I made this last night, decreasing zucchini to 2 cups (all I had), adding 1/2 a lb of leftover ground chicken and with homemade rice flour to make it gluten free for the hubs, and it was DELISH! My husband kept raving how good it was! Next time I’ll serve it with guacamole! I gave these a try, but my batter turned out to be dry; I am gluten free, so I used coconut flour, and coconut oil. They aren’t as pretty as your version, but the taste is still there at least! 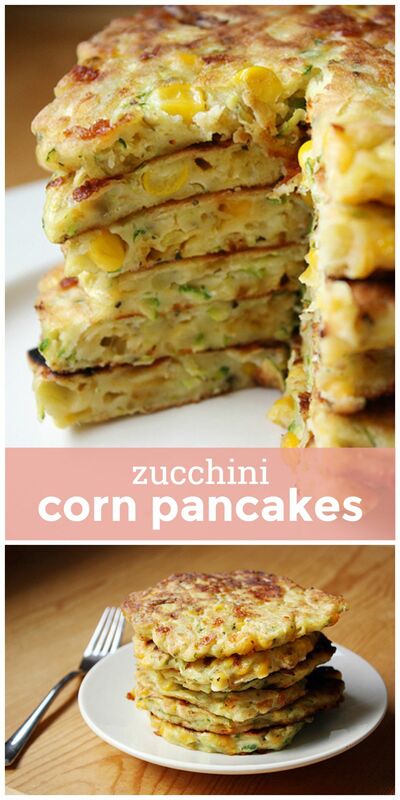 I think next time I will adapt this concept by adding the zucchini, cheese, and corn into boxed gluten-free pancake mix; it will have all of the ingredients in it to help it become more pancake-like. These look great! Can’t wait to try them with some fresh corn I bought yesterday! Yum! These are gooooood! I didn’t taste the cheese, so the next time I made them w/out cheese. Just as good! Pingback: The Makeshift Recipe | Fab to Fat and Back! I realized I only had a third amount of the zucchini I needed, so I tripled the corn. Well, I pretty much eyeballed the measurements. I used fresh rosemary instead of the dried herbs, and in the end we covered them in butter, honey, and sea salt. SO GOOD, we will definitely be making these again. I’m sure they’re even better with the correct measurements of veggies. Thanks! What are the nutritional stats for these? Thank you! Ro — I don’t know the nutrition facts off the top of my head, but you can enter the ingredients into a database that will determine it for you, like http://www.myfitnesspal.com/recipe/calculator. This looks soo Delish!! I am going to try to make them!! Just made these! Fantastic way to serve up extra veggies — they were terrific with sharp cheddar. Next, I will be trying them with feta! Yum! Gail — Oooo, feta, I like it. 🙂 So glad you liked them! Anyone try this wo the cheese? My LO is dairy free but I love the idea of sneaking in some veggies/protein w these pancakes. I made these recently and posted on my blog…they were delicious! I added some whole wheat flour and flax to them as well. Thanks for sharing! Asiya — Oooh, love those additions. So glad you liked them! Just made these…Delicious!!! Topped mine with sour cream and avocado. I would love to make these vegan so would probably use ground flax seeds instead of eggs…. will give it a try. These look amazing! I’m going to make these tonight for me and my toddler. Quick question: Can they be frozen? Gracias!!! Por compartir! Esta deliciosa receta!!,mmm! What kind of flour would you recommend for gluten-free? Claire — My best suggestion for this recipe is to use a 1-to-1 gluten free baking flour, like Bob’s Red Mill’s variety. Can you leave out the salt in these and they will turn out okay ? I’m on a low to no salt diet. Bernie — I wouldn’t recommend it, since the batter is more like a pancake batter. I made these and they were absolutely divine! I took leftovers to work and everyone raved about them. I used canned corn because that is all I had I would imagine fresh off the cobb would be really good. thanks for this recipe.